After coming out of Kumar's residence, she alleged that National Security Advisor Ajit Doval was giving instructions to the CBI at the behest of Prime Minister Narendra Modi and BJP President Amit Shah. Kolkata Crisis LIVE: Delhi Chief Minister and AAP supremo Arvind Kejriwal on Monday slammed PM Modi and BJP chief Amit Shah over developments in West Bengal, saying they needed to be defeated in the upcoming Lok Sabha polls “to save democracy” in the country. He said the “Modi-Shah duo was the biggest danger” facing the country and charged the two leaders with trying to “murder” democracy. Kolkata Crisis LIVE: Three-judge SC bench comprising Chief Justice Ranjan Gogoi, Justice Deepak Gupta & Justice Sanjiv Khanna will hear CBI’s pleas tomorrow against Kolkata Police Commissioner Rajeev Kumar & West Bengal govt for alleged non-cooperation in a case connected with Saradha chit fund scam. New Delhi: After hours of a standoff between her administration and a CBI team seeking to interrogate Kolkata Police chief Rajeev Kumar in connection with chit fund scams, West Bengal Chief Minister Mamata Banerjee on Sunday night began a ‘Save The Constitution’ ‘dharna’ (strike), demanding an ‘end to the misuse of central agencies by Narendra Modi-led Union government. The showdown is expected to cast a shadow on the budget session of parliament on Monday with the opposition expected to vociferously raise the issue. Notably, the evening drama began after a 40-member CBI team headed towards the residence of Kolkata police commissioner Rajeev Kumar. They (CBI officers) were stopped by Kolkata police personnel, who also forcibly took five probe agency officers including Bardhan to the Shakespeare Sarani police station. Meanwhile, CM Banerjee, who had extended support to Kumar on Sunday, also rushed to his (Kolkata police chief) house and was closeted with other top officers, including state police Director General Virendra. After coming out of Kumar’s residence, she alleged that National Security Advisor Ajit Doval was giving instructions to the CBI at the behest of Prime Minister Narendra Modi and BJP President Amit Shah. “I am sorry to say National Security Advisor Ajit Doval is giving instructions to the agency. He is implementing what PM Narendra Modi is asking for. He should tell the people that it is not correct,” an agitated Banerjee said. She also accused Modi-Shah duo of insulting her. Banerjee also alleged CBI officers came to Kumar’s residence without any search warrant to conduct a secret operation. “How can they come? One day, they will go to my home, Chief Secretary’s home and Home Secretary’s home. There is a constitutional break-down and they are trying to run a parallel administration in the states,” she told reporters outside the Commissioner’s house. “I will start a dharna (sit-in) at Dharamtala area to save institutions, Constitution and the federal structure of the country,” she declared. Condemning the attitude of the Modi government, Banerjee urged all security forces to be together. 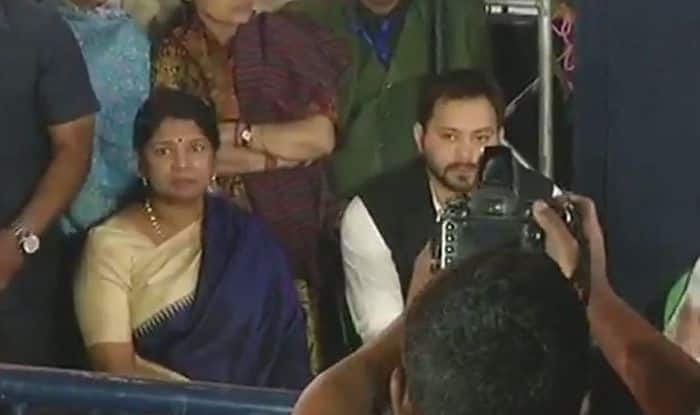 Congress President Rahul Gandhi and several opposition leaders including Delhi Chief Minister Arvind Kejriwal, Andhra Pradesh Chief Minister N Chandrababu Naidu, National Conference leader Omar Abdullah RJD leader Tejashwi Yadav, DMK leader MK Stalin and others extended their full support to Banerjee. Gandhi, who spoke to Banerjee, said in a tweet that the “entire opposition will stand together and defeat these fascist forces.” “I spoke with Mamata Di tonight and told her we stand shoulder to shoulder with her. The happenings in Bengal are a part of the unrelenting attack on India’s institutions by Modi and the BJP. The entire opposition will stand together and defeat these fascist forces,” he said.